#278 – Holding On: The Troubled Life of Billy Kerr [Spoiler-Free] – What's Eric Playing? Full disclosure: A review copy of Holding On: The Troubled Life of Billy Kerr was provided by Hub Games. Also full disclosure: this review only covers the first scenario so that it’s spoiler free. Content Warning: This game deals with pretty adult themes, and may not be suitable for all players. Please check with your game group and see if they’re interested in this game before you spring it on them; it’s not really the kind of game, thematically, that I’d want sprung on me without warning. As a result, this review will touch on some of those themes, as well, so if this game doesn’t sound like it’s up your alley, well, you’re already reading the review so I get the view for it either way. Some photos will be tagged with a content warning and hidden behind a link; trying to be sensitive to all readers. Thanks for reading! Alright, so, I think theme is incredibly important in games, for me. A good theme can save an otherwise kinda mediocre game, and a great theme can elevate a game to an all-time classic, in my opinion. For me, you’ll rarely see a game cross the 9/10 – 10/10 threshold without it having a theme that I particularly love. There are, of course, a few exceptions (I actually love the theme of They Who Were 8 but the game wasn’t for me, personally) and I defer to abstract games because, well, they’re abstract, but that’s the general mindset I approach games with. This has caused me to become super interested in games with unique themes. While “hospital” itself isn’t a particularly unique theme (I’ve even reviewed a hospital game, Code Triage), Holding On: The Troubled Life of Billy Kerr isn’t just a hospital game. Naturally, after learning more about it, I was enthused about checking it out and writing this review for y’all. To avoid spoilers, Setup and Gameplay will only cover Scenario 1. Both of these have their backs up to avoid spoilers. Technically, they’re only revealed during the game, so it’s a bit more fun if you discover them for yourself. I’ll be obfuscating them in a few photos (at least blurring aggressively) to try and preserve that for y’all, because I care. The cards with exclamation points on them are Events; more on those later. It doesn’t really matter, but set two of those in the room next to the Break Room. You’re all ready to start! Anything else you find in the box won’t be used in this scenario. Note: The game has some significant changes at different player counts. For the full list, see the Player Count Differences section. So, over the course of Holding On, you’re attempting to complete a Scenario by fulfilling certain objectives. Those objectives change from game to game, and new rules for setup and gameplay can add new actions or change the way that your characters can act on their turns. Thankfully, the first scenario is about getting your bearings and learning the game, so you don’t have to worry too much about rules beyond the basic ones; that said, this is not an easy game, so don’t get too comfortable. Over a series of rounds (days) you’ll be working to help Billy as best you can. Each day has three phases: Morning, Afternoon, and Evening. At the start of each phase, the Shift Manager will reveal a Patient Card for that phase. This represents Billy’s current condition. When that happens, generally, you can provide Medical Care or Palliative Care (left or right side of the cards). Some cards are Emergencies; you can only provide Medical Care. Now, the Shift Manager moves workers from the Break Room and places them on the pawn spots on that card. If the Shift Manager cannot pull enough pawns from the Break Room, then they must hire one of the On-Call Assistants, have an existing player or Assistant on the card cover the gaps (gaining one stress per empty spot), or pull players from the immediately previous shift. If they still cannot fill all the spots, they must take a Hospital Warning. If you ever take two, you lose. So don’t do that. Once you’ve set enough players on the spaces, you must decide to perform Medical or Palliative Care. One caveat: you must perform Medical Care at least once per round. If you don’t, well, you’re not really doing the “hospital thing”, so you get another Hospital Warning. 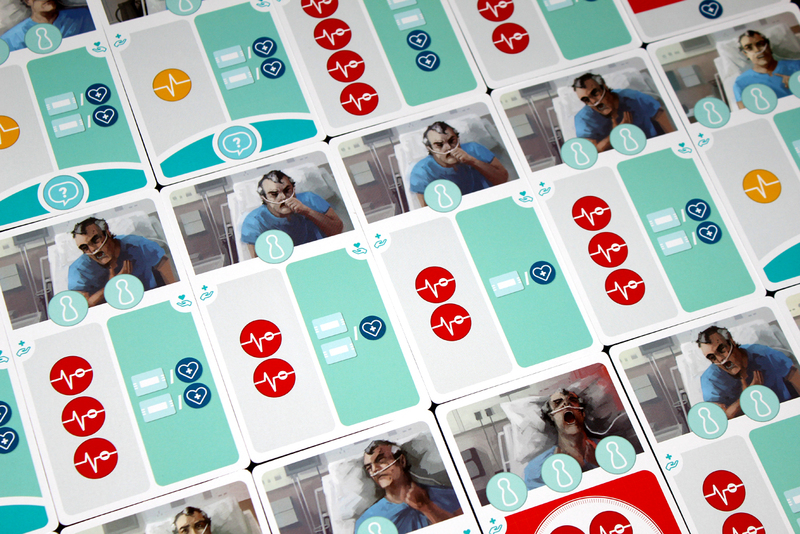 Medical Care works by having players whose pawns are on the card team up and place Care Tokens to cover the red spaces on that side of the card. If any red spaces are uncovered after this step, move Billy’s Health Tracker down by one for each red space. If it’s an Emergency and you cover all the spaces, one of the players whose pawn is on this card immediately gains a Care Token. If you cover a yellow space, move Billy’s Health Tracker up by one space. Palliative Care is more about you helping Billy with his memories and emotions, instead of helping him medically. Both are important to truly helping him, however. Performing this action will be equivalent to doing nothing on the Medical Care side, but you will usually be able to gain Care Tokens or Partial Memories. When you gain a Partial Memory, set it near you. If an Assistant gains Partial Memories or Care tokens, place them on the relevant spaces on the Shift Manager board. Gaining Partial Memories: When you gain one, shuffle the Partial Memory deck and draw from the bottom. If you hit an Event, resolve it (more on that later). Partial Memories stay unrevealed until the end of the round; keep them face-down. Inquiry: So this isn’t one of the main two options, but some cards have a question mark symbol at the bottom symbolizing that Billy is feeling up to being asked some questions. Any player on the card may now Inquire more; you do so by choosing a number between 1 and 5 (corresponding to which part of Billy’s life you want to know more about; more on that later) and drawing cards from the bottom of the Clear Memory deck until you hit that number or an Event. If you hit an Event, resolve it. You only reshuffle the deck (and the set-aside Events) when you ask for a different number; if you’re asking for the same number, just keep drawing from the bottom. Some of them are good, some are bad, but they both depend on what point you’re at along the Health Tracker (color-wise). Once you complete an Event, set it aside until the next player needs to draw from that deck, then shuffle it back in (unless the Event says to remove it after use). I find that just putting it on top of the deck (since you draw from the bottom) is sufficient, since you should shuffle beforehand anyways. If you’re forced to (or choose to) move a player forward from the immediately previous shift, that’s kind of bad for their mental health (you’re overworking them), so they gain Stress. Gaining Stress is always bad (hey just like real life), so place one of the red tokens around your pawn and immediately discard a Care Token or return one of your Memory Cards to the relevant deck. If you have neither of those things, well, you can’t lose what you don’t have. But remember, this can force you to lose Clear Memory cards. That’s not good. Generally speaking, On-Call Assistants can’t gain Stress. Assistants can, however, but they can’t have more than two Stress. Nurses (the players) can’t have more than three stress. If any player or Assistant hits their stress threshold, they will go On Leave the next round (day) and be unavailable. Also, Nurses can’t perform as well when they’re stressed, so they lose the ability to perform the Inquiry action at two or more stress. Try to avoid that. If you’d like to do that, you can also preemptively send a player in the Break Room on leave, either after the Morning Shift (they’ll return at the start of the next day) or after the day (they’ll return at the start of the day after next). The upcoming Shift Manager cannot go on leave unless they’re forced to do so by being Overstressed; if that happens (you’re forced to go on leave and you’ll be out the turn that you’re Shift Manager) the Hospital gains a Hospital Warning. Don’t do that. The round ends after the Night Phase, but during the Night Phase, once it’s staffed, any one player may gain a Care Token that can be used during that phase (or saved for later). If any pawns are still in the Break Room (players or Assistants), they immediately gain an extra two Care Tokens each. That’s pretty huge. Resolve Partial Memories: Look at the number of lines on the side of a card; that will tell you what row it goes in. Flip the card over and add it to the space under the board. It should connect with other Memory Cards to its left and right; it may not, at first. It will also potentially connect with other cards from above and below. These are critical because they’re the first step to clear memories. Check Clear Memories: This one is tougher. Now, reveal the Clear Memories. If they match with any of the Partial Memories (check the ticks on each side of the card and Billy’s location is always the same in both images), place the Clear Memory on top of the Partial Memory; for Scenario 1, you’re one step closer to winning! That’s good. If it doesn’t match, well, bummer, it’ll be returned to the deck at the end of the round. Now, the round has fully ended. Pass the Shift Manager board (and all Care Tokens / Hospital Warnings on it) to the next player. Good luck! Once you’ve completed the first Scenario, you’re ready for the full campaign! Even then, I might give it a couple more plays to get accustomed to the gameplay before you dive in fully. 2 Players: There are fewer players, so the Shift Manager may move forward once without a penalty (and may move from Morning to Evening, rather than just one Patient Card at a time). If you end up not needing to move the Shift Manager, move them to the Break Room at the end of the round and gain two bonus Care tokens. Hooray! 3 Players: The game plays as described in Gameplay with no changes. That’s always nice. 4 Players: The Shift Manager’s pawn does not participate each round (and cannot gain the bonus Care Tokens). Remove them at the start of the round and put them back in the Break Room at the end. Generally speaking, I find that I’ve enjoyed this at two and three players. At four, it seems like there will always be one player directing rather than playing, so I’d probably just rather stick it out at a lower player count. Your mileage may vary on this recommendation, though. Even though the game is Holding On, you may not want to save your On-Call Assistants for very long. You take a risk when you use them, but they’re best used to try and build up a store of Care Tokens, since they can do everything other players can but gain Stress and Inquire, basically. I use them as a quick break and then keep moving them forward; sure, it’s a tough day for them, but I need those Care Tokens. I once gained like, 10 Care Tokens in one day because of an On-Call Assistant and an extremely lucky draw. Don’t underestimate them! They can be a literal life saver. I generally try to shift to wanting Clear Memories for a specific row once I have three in that row. Partial Memories are pretty random, so it’s hard to try to get ones from a specific timeline, but if I already have a bunch I generally then assert that it’s time to try to start gaining Clear Memories for that timeline. It sometimes works out. If that doesn’t work, it’s not a bad idea to just go deep into one Timeline. I had one partial memory in II one game and just Inquired until I had all six of the II Clear Memory cards. I mean … I won, so that means it wasn’t the worst possible strategy. You need some Care tokens. You don’t want to run out; if so, you can’t Inquire, which you will have to do to win Scenario 1. Make sure you’re spending some time getting them when you can. It’s better to do Medical Care early. Better to take the cards you know over the cards you don’t, and if you leave it for too long you may have to make a really tough choice. Sure, you might have the opposite problem (a Night Phase Emergency card is rough), but I think if you get an easy Morning or Afternoon card I usually just do Medical Care right there. I generally did not spend many Care Tokens on healing Billy. You can spend one on a yellow space Medical Care to increase his health by one. I didn’t do it that often, because we were either too screwed to do it or were doing just fine, but that might change in later scenarios. Just telling you in Scenario 1 that I didn’t find it particularly helpful. Know how to manage stress. It’s pretty much unavoidable (you will just have some shifts with Too Many Jobs To Do), so you should figure out how to work with it. The first thing to do is to insulate yourself; keep your upcoming Shift Manager in the Break Room or on the first shift (only if they’re not alone) so that you can use someone else to get moved up in case of a shortstaffed shift. Seriously, you do not want Hospital Warnings. Really interesting theme. I’m always here for themes that are outside the norm, and this is nothing, if not that. The game is thoughtful, which is good given the seriousness of the subject matter. This isn’t a game that’s playing it for laughs; it’s serious, and that’s something impressive to see from a board game. It shows that the hobby is developing and flexing muscles it doesn’t often use, and I love it. I’m excited to see what interesting concepts Hub Games does next (and the hobby as a whole). I think fans of the game are also treating it with the respect and gravity (generally) it deserves, which I appreciate. It’s a tough topic to make into a game, so making it into a game is already impressive, but doing so respectfully is something worth commendation. Really good insert construction. It’s very well-designed. Fits the components well and has space for further organization of the Scenario cards. I love the art. It’s a very specific style and I’m into it. The Memory cards are also really interesting. The graphic design / iconography is also really sharp. It’s crisp and consistent and lends a very professional look to the game. I’m a fan of both, really. I’m very interested in the narrative. I wish I had more to say about that but it’s a spoiler-free review, so I don’t! Some players may be frustrated by some of the luck elements. There’s a bit of randomness to how the Patient Cards are put into your Morning / Afternoon / Evening Shifts, and that might mean you have very good shifts or almost-impossible shifts, depending on how the cards go. There’s not a whole lot you can do about that, though. There are a lot of icons. As I mentioned for Dreams of Tomorrow; that does make the game a bit tougher to learn, initially. It helps that they have a really thorough guide on the back of the rulebooks. Continuous bad draws on the Clear Memory Cards are, in particular, frustrating. Best-case, they drag out the game a bit longer, but more often than not you end up drawing the same card a few times, which is extremely frustrating. I understand why that happens in Scenario 1, but it’s still occasionally kind of irritating. It’s a tough game to get to the table. “Excited” isn’t the word a lot of people would use to describe a game with this theme. One of my closest gaming friends used more of a “hell no” when I showed him the game. He humored me for one play, but that’s all I’m going to get from him. I was legitimately worried I wouldn’t be able to do this review because too many people were aggressively not-interested in playing this. It’s definitely not the reaction I got for, say, Spy Club, which has a far more upbeat theme. That’s unfortunately the nature of this kind of thing, though; not everyone is going to be enthusiastic about going on the journey that the game offers. That’s fine, but I more put this as a Con because it requires extra work to get it to the table, as you have to find a group who will be into having that kind of experience. Edited for your viewing pleasure. Overall, Holding On is a very unique experience. I mean that in a very positive way — I enjoy the core mechanics of the game (it reminds me, in some ways, of Spy Club, but with less card flipping). The timeline elements and construction is super neat, and the art / graphic design of the game is phenomenal. It does a good job capturing the solemnity of its material, and I appreciate that it endeavors to do so respectfully. I think there are a lot of experiences gaming can expose us to that take us outside our (individually limited) worldview, and I appreciate that Hub Games is making something like Holding On as proof that there are great games waiting to be made in that space. I see Holding On as a triumph, yes, but also a challenge — there are so many unique themes out there, waiting for someone to figure out a way to connect players to them. What lessons can you take from a game like Holding On, and how can you apply them forward in your own work? I’d love to hear y’all’s thoughts on this. In either case, if you think you can handle an intense gaming experience, I’d highly recommend checking out Holding On! Just make sure your game group is down for it, first. Posted in reviewTagged campaign games, card game, card games, cooperative, cooperative games, hospital, hub games, narrative game, narrative games, storytelling games, tabletop, tabletop game, tabletop gamesBookmark the permalink.